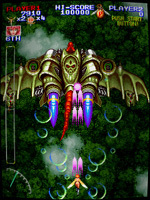 Raizing's programmers of 'Shippu Mahou Daisakusen' aka 'Kingdom Grand Prix' combined the best of 'Mahou Daisakusen', their previous shooter with the idea of a racing game. Choose one out of eight competitors who enter to win the Great Race of the Kingdom. Four of them are old friends we met one year before in Mahou Daisakusen. These are Gain the Warrior, Chitta the Magician, Miyamoto the Samurai Dragon, and Bonum the Sorcerer. New fighters joining the team: Nirvana, the Fairy, two kids called Kickle & Laycle, Honest John, an Automatic Armour and the Goblin Bul-Ginain. All of them use their unique weaponary that can be expanded by collecting magic books in the game. Each character has two different weapons depending on the two different colors of these books. Furthermore the [B] button releases a nice smartbomb which is different for each character as well. At the bottom of the screen is a speed meter displayed. It rises and falls depending on your current speed. There are two ways to keep it high: One of them is your vertical position. Moving your aircraft up, increases your speed, and moving it down makes you fly slower. But staying at the top of the screen all the times would what make it almost impossible to detect all the incoming attacks, so Raizing offers you a second option to keep your fighter speedy: Hold the [A] button whenever you need to speed up. (thanks to Matthew Horne for this hint). 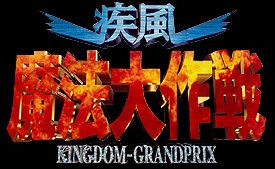 Kingdom Grandprix is a great multi-path shooter game that gives you a total of 12 stages which are nicely drawn and quite innovative. Destroy trap walls in the dungeons, burst giant rocks and flee from the destruction of a fire. You would need to play this game more than once to see all the beauty Raizing created here to spoil your eyes. I believe that Kingdom Grandprix is the rarest Raizing / 8ing PCB of all. You will probably need a lot of patience and luck to get this one for a reasonable price. But since it's a hard to beat shooter game with a somewhat useless racing theme, it's not recommendable for everyone. Maybe you should play it a few times before you consider to spend a lot of money for it. Otherwise it should be easy to resell it, since this game is very much in demand.